After discovering Doom mod Project Brutality, I loved how the game had variations of different enemies and made the game much more fun to play among its many features. So for fun, I drew up my own variants of Duke Nukem 3d enemies. 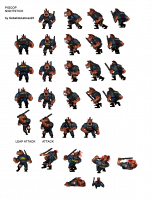 I hope one day there can be an awesome mod like Brutal Doom/Project Brutality for Duke 3d. This is the only angle. Feel Free to use them. Just credit me. Also, I'm working on babe variants too! Very nice, I like this idea. Different amounts of health and weapons too? Can you do the rotations for your variations? Playing the game with that would definitely make replays a lot more interesting. Babe variation sounds interesting as well. Another idea I had was rescuing babes like in Manhattan Project. Killing them never made much sense to me. These are amazing, I really dig the DNF Battlelord one. 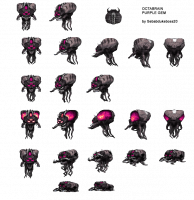 Please make full sprites of these and I'll even add them in my future sprite based videos! These sprites are really cool! I really like these sprites! Can't wait to see them used in future projects. These are simply amazing! I love when people mod stuff, create variants and etc. I can't explain why but I just love to see or create different versions of something. Anyway, good job. Thanks for all the comments. I'm currently concentrating on my adult flash game, but time to time I'll make more variations. If people are serious about using the variants in their mods, I might make full sets in the future. And here's my first pass on the babe variations. I've already used a few of your older versions of babes in Part 2 of my Typical Day video so having even more variations of the Aliens and babes would give me way more ideas for future videos. I'd also love to see more Duke mods use these variations as well. Awesome. Let me know when you're done. Also would you happen to have a backup of all the stuff you posted in the Community Stockpile? A good deal of the stuff you posted isn't showing up. These would fit right into Duke It Out In DC's FBI office! Here are some more babe variant's I've done recently using actual pics. They'll probably show up in Abduction 4.1 too. Use if you would like to, but please credit me. If you make a complete version of those, you would do a great service. We will certainly find an application, furthermore they can serve as a basis to create new ones. One in particular it's what I need for this purpose. I'll see what I can do in my spare time. I'll start with the easier ones first. If it's all right with you, I'll be using the babes in Atomic Crisis, they're fantastic! Sure! Let me see the finish product when it's done. It will be a while, but I will definitely share it with you. Here's a slimer and Octabrain. I enjoyed making the slimer scarier looking. The octabrain is recolored to resemble the Duke 3d action figure version. I'm working on some Liz Trooper variants. You should post all of your completed works also on the resources stockpile, where people can actually find them. Usually the other sections are not the first place where someone search. Hey this stuff looks promising! You know there was always a thought about more varations of pig cops. Can't wait to see more if there is ofcourse? This one is a melee attacker and should have faster speed and maybe more HP. I also made him a little more red to show some rage. Armed with a AA12 drum magazine. If I could get someone to code these into the game, these would be amazing additions to Atomic Crisis. 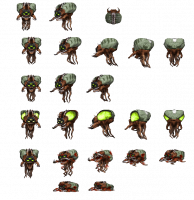 It'd be nice to bring some new enemies, and not just Duke 3D's, or re-skinned enemies.